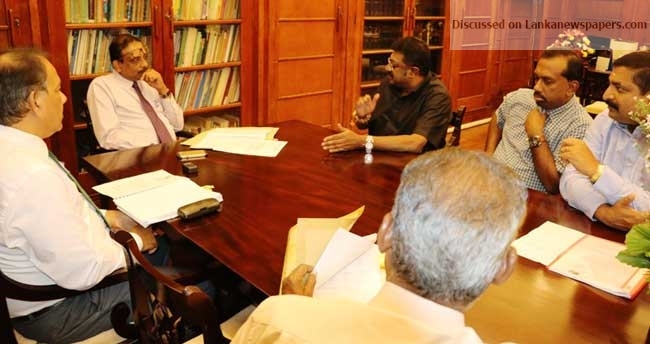 A special discussion was held between the Secretary to the Ministry of Finance and the Ceylon Workers’ Congress (CWC) today (05) regarding the increment of basic daily wage of estate workers, says the Vice President of the Congress, S. Arulsamy. The discussion was held with the mediation of Prime Minister Mahinda Rajapaksa, according to Arulsamy. During the several rounds of discussions that were held between the Planters’ Association (PA) and the joint trade unions of estates, the PA has presented a suggestion stating that it is possible to increase the basic daily wage of the estate workers from Rs 530 to Rs 600 and provide them a daily wage of nearly Rs 1000 with all allowances included. Ceylon Workers’ Congress Leader Arumugan Thondaman and Deputy Minister of Plantation Industries Vadivel Suresh have drawn the attention of Prime Minister Mahinda Rajapaksa in this regard. The discussion has focused on rendering the remaining amount of the salary that should be given to the estate workers from the reserves of the Tea Board and the giving them to estate companies for a short period of time on the basis of retrieving the money by charging an interest. The meeting has also discussed on retrieving the grants given to the estate companies through the finance ministry whenever the price of tea is hiked and obtaining the Cabinet approval for this.